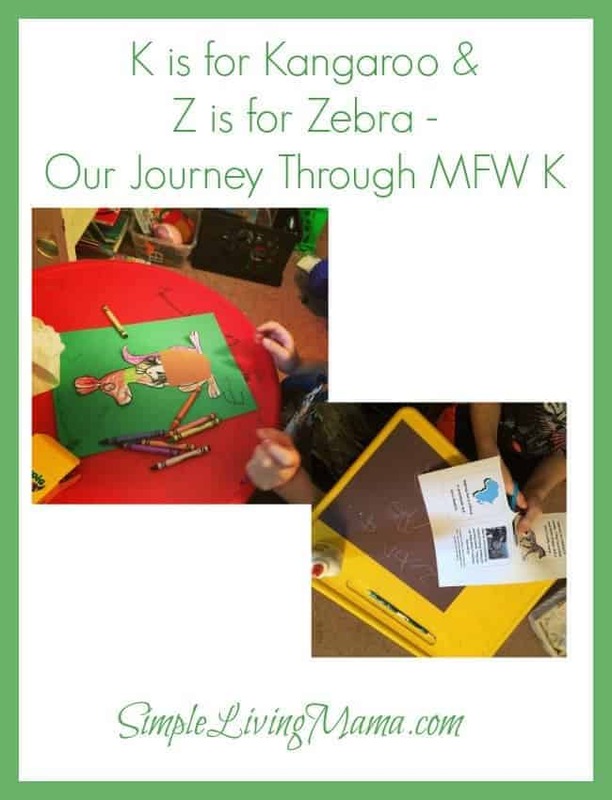 After taking an extended summer break for my morning sickness, we dove back into My Father’s World Kindergarten with the K is for Kangaroo and Z is for Zebra units. I’m going to combine these two units in one post because we didn’t do a lot of extra activities for either unit and I lost all of the pictures I took with my regular camera! My computer had a drink dumped on it and some of the pictures weren’t backed up on my external hard drive, so they are gone. 🙁 So, the pictures that I do have are from my Instagram account, which you can follow to see more of our homeschool and life adventures with My Father’s World and everything else! We still plan to finish up MFW K by Christmas or shortly thereafter, so we are rocking and rolling right along! I definitely see the wisdom in delaying kindergarten a bit, especially for boys. 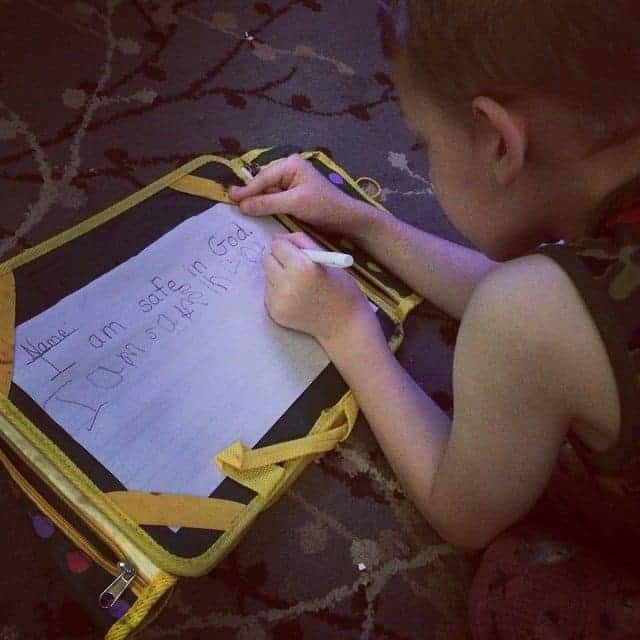 Bug just turned 6 and I was very impressed with his handwriting even after our break with very little practice. Obviously, he still needs some work, but it’s not so much of a drag for him anymore. Speaking of writing, I am having him write our words to remember. I simply copy the words on lined paper and have him write underneath my writing. 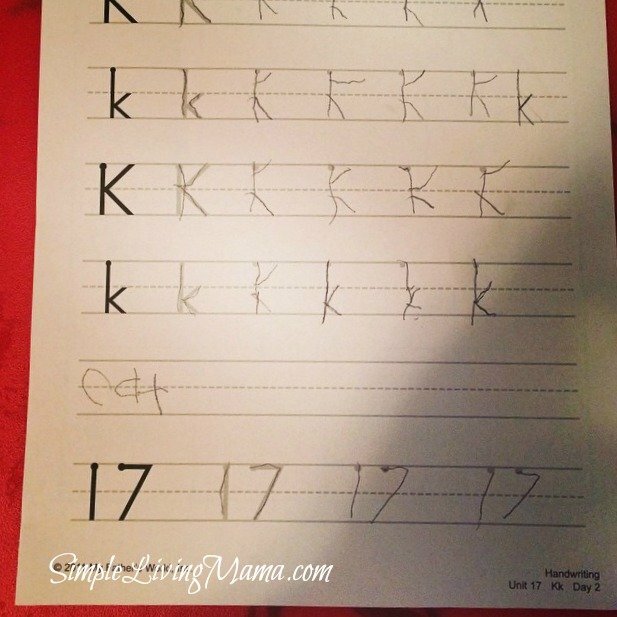 I got the kindergarten lined paper pad from the Dollar Tree. The book we read at the end of this unit was “Katy No Pocket.” I had the kids do a simple kangaroo craft. I had the source saved on my other laptop, so I’ll have to search for it again! The main activity we did for the Zebra unit was a mini-poster of zebra facts. 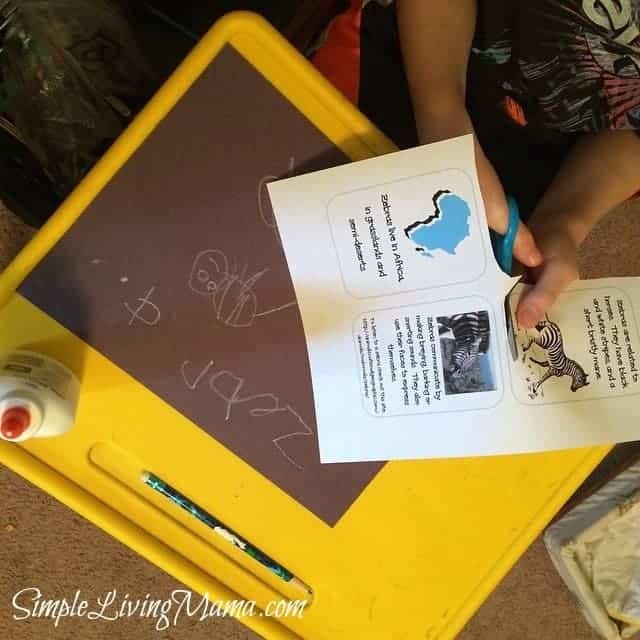 I had the kids draw a picture of a zebra with a white crayon on black construction paper. I also had Bug write the word zebra at the top. Then we cut out the facts and glued them on the sheet. Of course, we discussed the facts together. 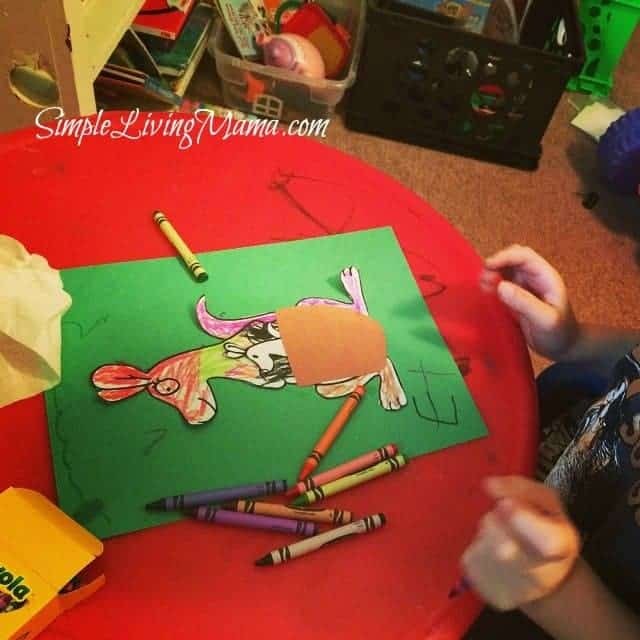 Other activities we did during this unit included making zebra pudding, making an Africa poster with African animal pictures, and coloring stripes on a zebra picture that I printed from the web. I wish I had more pictures to show you! We also had a lot of fun reviewing Australia, Antarctica, and Africa and talking about the different animals that live on those continents. We can’t forget our other MFW activities. 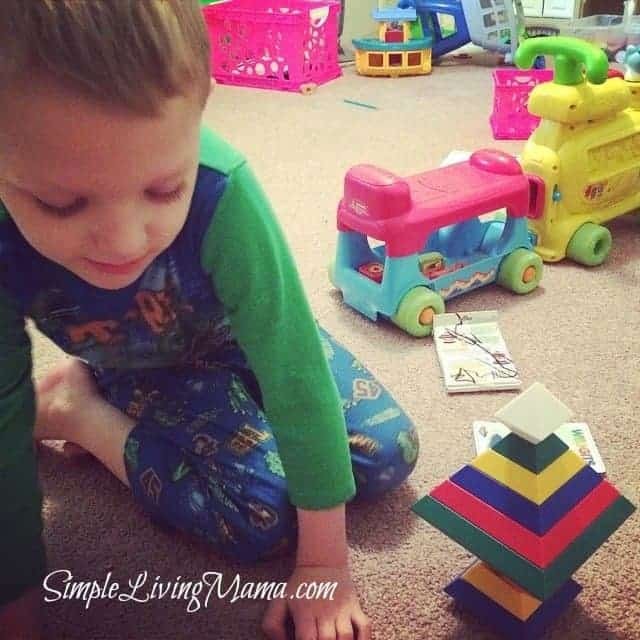 Bug loves playing with the Wedgits from the MFW Preschool package! 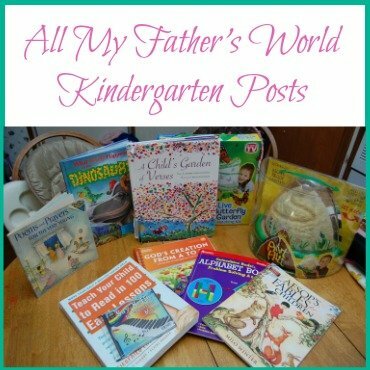 Follow Joanie Boeckman (Simple Living Mama)’s board My Father’s World Kindergarten on Pinterest. Love the idea for the continents! In class we’ve been learning about the different continents too, and we got them to make their own little passports where they could fill in information about animals etc. it was great fun!